He loves cars in need of love. She loves cats, especially hers. And they also happen to love each other. 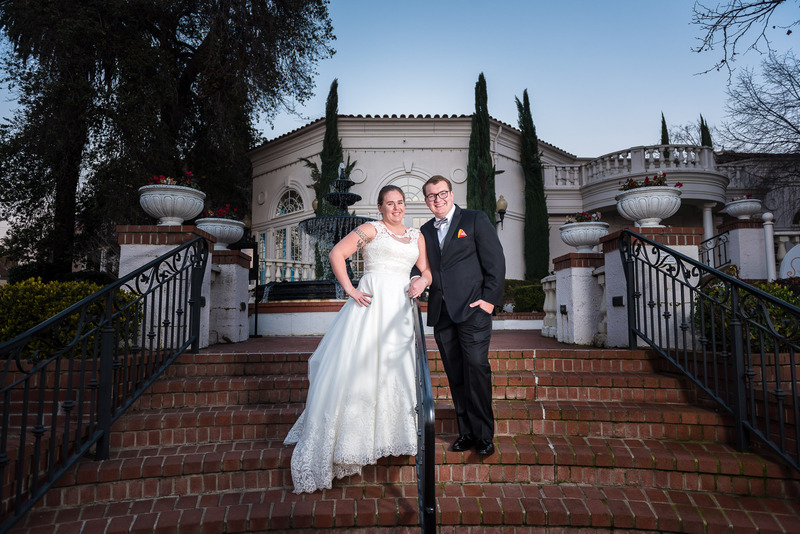 With that truth in mind (as well as so many other shared loves), it was time for Chelsi and Jake to tie this knot with a little help from the folks at Vizcaya! These lovebirds returned to my fair city of Sacramento for their wedding day despite living their lives down in the deserts of Southern California. Now, I say “returned” because Chelsi had spent several of her last few years in college near Sacramento: years of study and years of dating a certain future husband. With the milestone of graduation in her rear view, these two moved away and into planning their coming wedding. Finally, that day had arrived. Evidently, Chelsi and Jake weren’t the only ones excited about the wedding day. The spacious Vizcaya Pavilion was stunning and ready for wedded bliss. Even the salt and pepper were dressed to the nines. Well, we may have put those rings there. …And a few great friends for comic relief. Their colors brought a pop to a chilly January afternoon. Ready for the future. If only those boys would hurry up. ‘Cause, you know, the boys were busy. That quiet moment alone. Covered in shaving cream. Brian the Best Man. This is the “Don’t lose it, man” look. Chelsi sneaking a peek before the first look. His first look at his lady in her finery. Fresh from the first look. Bridesmaid Kimberly looks on at the first look, lookingly. Our hero. You can just hear Chelsi swooning off camera. The lovely bride and the heroine of our story. Waiting for her prince to come… I love how Vizcaya feels removed from urban craziness even though it is nestled in down Sacramento. The touch of hand can settle all sorts of wedding day nerves. She had to find some way to stay warm. Nope. No rain. Just a lovely flowing fountain out front at Vizcaya. The time had come to set off for the ceremony. Fortunately, she was in good hands. Low lights and plunging temperatures welcomed Chelsi and Jake into new life as husband and wife. All the family we could bear to fit in one frame. And then off to cocktail hour. Making time for guests from all over the country. Making time to stay warm. The doors were opened to the Vizcaya Pavilion, and the guests walked into warmth beneath this stained glass work of art. And yes, finally, the bride and groom came out of the cold to make their grand entrance. They’ve got each other’s back. Making their way to their table for well deserved meal. Maid of Honor Jessica told it like it was during her sweet toast. And mom brought on the second round of toasting/roasting. Owning the floor with their first dance. Voted “most likely to have the first dance of the night”. This lucky lady got a spin on the dance floor with our groom as well. Grandma and Grandpa bring the comedy. My favorite pic of the night? Maybe. The happy beginning for Chelsi and Jake. Chelsi and Jake, it was such a pleasure to be a part of your wedding day and to see you venture into life together. I can see that you’ve got some great family and friends to support you along the way, and of course, you’ve got each other. I pray that the road ahead is far greater than either of you have even imagined. Congratulations to you! Why yes, we do photograph weddings at Vizcaya—and we get a kick out of it! Check out our wedding photography packages to see what we can work out for your wedding day! Wow really enjoyed the creativity and humor…great job!!. Where is mother of the groom….pictures please! !